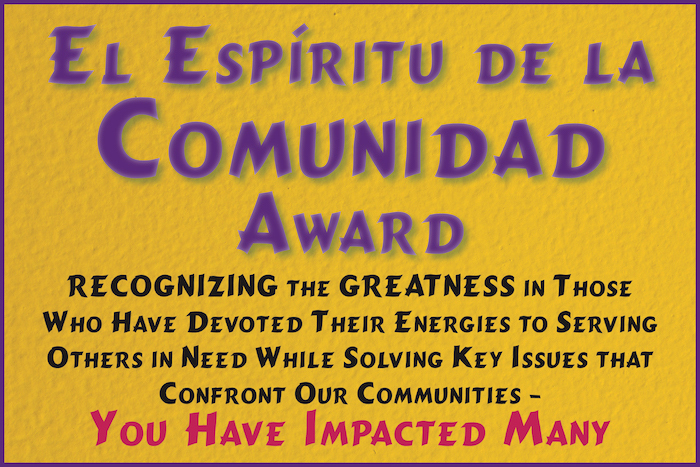 Two award programs in this category: El Espirítu de la Comunidad Awards for Grassroots Community Leaders and the Maestro Award for exemplary educators. For the Espíritu de la Comunidad Awards, we select leaders who have made an impact in their respective communities throughout the years. Their leadership truly embodies the spirit of their community. 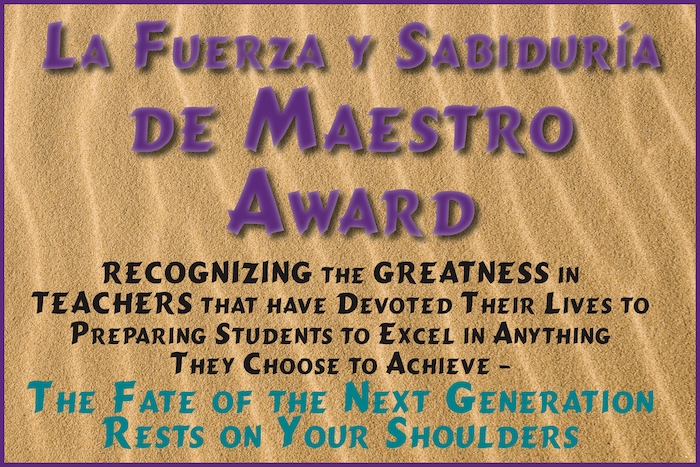 Maestro awards ….more. Espíritu de la Comunidad Awards – In every city there are always a group of people or individuals pushing for better opportunities, for equal rights, for better security and protection or for better education. By giving these community leaders recognition, it encourages them to continue their efforts. They come from all backgrounds, have their own stories, struggles and goals, but all of that is what pushes them forward to help their community succeed. NOMINATION CRITERIA: Do you know someone who serves as an advocate for the betterment of communities within North San Diego County, is a promoter of justice and/or self-sufficiency, empowers youth and families, and forges a path for others? Perhaps you know someone who promotes sustainability, has the ability to collaborate, is a good communicator and emanates positivity? If so, these are the qualities we believe would define the next Espíritu de la Comunidad recipients. Award recipients will be notified by August 20, 2018. The Awards Ceremony will be held in conjunction with the 2018 San Diego Latino Book & Family Festival on September 15, 2018. Another awards program is the Maestro Awards. This program is to recognize the work of teachers towards a better education. By giving recognition to these teachers, our hopes are for them to feel empowered and continue with their efforts. NOMINATION CRITERIA: Do you know of someone who is an exemplary teacher who goes above and beyond the classroom, is creative, serves as a mentor, is an educational activist, and is committed to multicultural education? Perhaps they are also a lifelong learner, a leader and an innovator? The Awards Ceremony will soon be decided. You will be updated with this information. As we approach the date, updates on the activities will be sent out to all finalists. The International Latino Book Awards are held annually by Latino Literacy Now, a California 501c3 non-profit, in conjunction with Las Comadres para las Americas, & Reforma: The National Association to Promote Library and Information Services to Latinos and the Spanish-Speaking (an affiliate of the American Library Association). For your records, you can still access the application form, but applications are not accepted anymore. Many of us would love to see more movies being produced that star Latinos & feature Latino themes. Realizing that many movies start with a great book, Latino Literacy Now has created a second competition within the framework of its International Latino Book Awards: the Latino Book into Movies Awards.